Helping The Cobb County Department of Transportation explain its future plans to the greater public. Gaining widespread approval for massive, new transportation plans depends on communicating it effectively. The Cobb County Department of Transportation wanted to do just that, but in a more exciting way than ever before. That meant making highly technical information accessible and compelling. So they called on Pearl Multimedia to pave the way. People can become overwhelmed by data and tune out important messages. But they eagerly tune into social media. 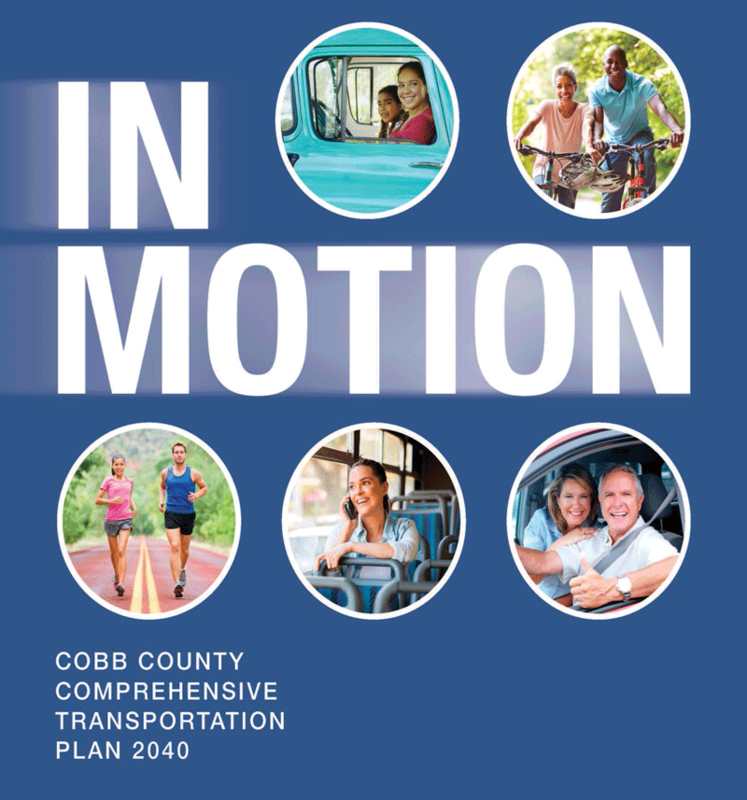 So I brought in Tracy Kopsachilis, a graphic designer in New York, and we created “In Motion.” It’s a 12-page printed booklet about the Cobb County Comprehensive Transportation Plan 2040. First we created user personas and created fictional characters living with the changes in 2040. We also developed brand messaging that would appeal to the CCDOT’s target audience. To aid in the storytelling, we crafted first-person narratives that included friendly commentary on the benefits and nuances of CCCTP. Around these, we worked in technical data, chunked into bite-sized pieces. To present these stories in a visually exciting way, we designed pages that mimicked social media platforms. In accordance with style guidelines from each company, we simulated pages from Facebook, Yelp, Pinterest, LinkedIn, and Twitter. We also created simulated email and text messages. Cobb County has a diverse population, and we did extensive stock photography research to match it. We also created custom maps and illustrations to further explain areas of interest. With this brochure in hand, the CCDOT was able to draw people in, and create a focus for dialogue during public forums.